Poods Park Skate Jam w/ Lifeline and Skate Rising. In collaboration with Skate Rising and our Life Line kids we join together for a day of food, fun, skating and making new friends. Charity Golf Tournament at Encinitas Golf Course. Congratulations to the Brixton foursome who won the tournament! 15 boys and girls from Keiller Academy and the Monarch School spent an amazing week at the YMCA Skate Camp at Lake Sequoia. RFTH Scholarships For Monarch School Students. College Scholarships awarded to 4 graduating Monarch School Seniors. The Best to you all on your college careers! Open-Source Skateboards Board Building Program At Monarch School. An amazing opportunity for 12 High School students from the Monarch School to design, shape, build and style their own boards. All part of the S.T.E.M. (Science-Technology-Engineering-Math) curriculum. These 8 High School Seniors from the Monarch School had the opportunity to get a guided tour of Brixton by co-founder owner Jason Young. ‘Career Days’ help open young minds to future options and career possibilities. Monarch School Skate Jam And T-shirt/Slap Bracelet Giveaway. Monarch School Holiday Skate Jam & Demo, T-Shirt and Slap Bracelet giveaway. Keiller Academy Year End Party And Giveaway. Raffles, giveaways, food & plenty of rippin! Admission cost: individual sign up $175 foursome $650. Admission includes: Golf, lunch, dinner, and player gift! All proceeds go directly to the Rollin From The Heart Foundation. Come join us Friday November 10th at The Encinitas Community Center 1140 Oakcrest Drive, Encinitas, 92024 from 5-9 p.m. for an evening of Art and Music. There will be a Silent Art Auction, raffles, beer, wine and finger foods. as well as live musical entertainment. This is a family friendly, all ages welcome event. Please come join us and bring your friends. Anyone willing to donate art or other raffle/auction prizes should contact John at 760-585-8454. These 13 lucky boys and girls from Keiller Leadership Academy received a one week fully paid campership to the Element/YMCA Skate Camp at Lake Sequoia in Sequoia National Forest. They also receive round trip transportation, as well as a new skateboard, shoe, shirts and lid. 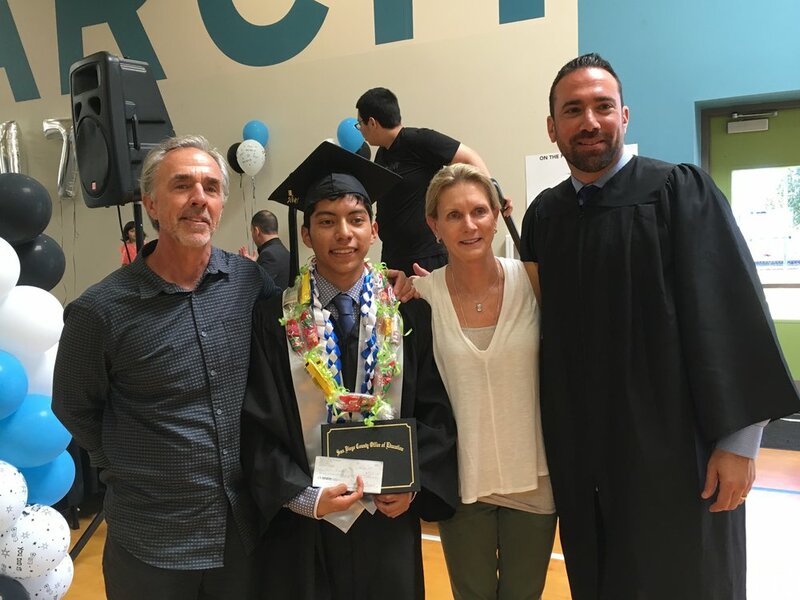 Monarch High School Graduation Uli has been active in RFTH as a participant and now volunteer/mentor and also received the RFTH campership award for two years. He will be attending attending Point Loma Nazarene in the Fall. Congratulations Uli! Over 40 boys and girls of from The Keiller Leadership Academy received a full skateboard setup along with a helmet for the Holidays from RFTH. Hope they have a Rollin', Merry Christmas! RFTH skate mentors distributed and help the kids assemble over 45 new RFTH skateboards and scooters. A bunch of kids from Crown Heights, Oceanside Were Rollin' into the Holidays in style! RFTH is proud to be the chosen charity for this great event. Come on out this Thursday December 15th and support J Grant Brittain Photography and music by Chris Cote. Brought to you by @slvdr_brand : featuring many of Grant’s iconic skate images from the 80’s and more : music by the one-and-only @chriscote : suggested skateboard donations to benefit Rollin’ From The Heart, bring a deck or cash! Calli Kelsay of Skate Rising and Amelia Brodka of Exposure Skate invited 8 girls from Keiller Academy to spend the morning skating with all the girls and young women involved in their Foundation. Go on line @skaterising.org and @exposureskate.org and check out the great work they are doing. Our biggest skateboard and scooter giveaway to date. I think RFTH helped to make a lot of these kids who's families are struggling with homelessness a little bit brighter. Over 65 skateboards, scooters and helmets were distributed. we skated scootered, had sandwiches and snacks and our RFTH mentors shared a lot of laughs and high fives with all these beautiful little souls from The Monarch School. High School students from The Monarch School in San Diego spent a few hours with Marketing Manager and Pro Skater Jeff Budro shared his insight and knowledge about the design, manufacture, distribution, marketing and sales required in the skateboard industry. The students were able to witness the manufacturing of the boards and speak directly with employees about their jobs. a very enlightening and fun day for all. Focusing on how the LA84 Foundation can aid skateboarding NGOs in the future. A fantastic forum with President and CEO Renata Simiril and V.P of Marketing and Communications, Jeremy Rosenberg. Myself (John) and Tommy Barker were invited to spend the afternoon in group forum with the leaders and founders of the most impactful Skateboard non profits in Southern California. A very powerful day. 42 boys and girls that are members of the Keiller Skate Club received new Skateboards and lunch. Needless to say 42 kids went Rollin home that day completely stoked! David Stoddard Brand Manager and Co-founder shared his entrepreneurial insights about starting and running a successful lifestyle apparel and clothing company. The students toured the facility and spoke with various employees about the specific jobs and duties gaining insight about job possibilities and career opportunities. Please join us at The Encinitas Community Center October 15th from 6-9:00p.m. for the 2nd Annual RFTH Silent Art Auction and Raffle. There will be over 50 amazing local artists who have donated their work for a silent auction. Raffle items will include Gift Certificates for massages, restaurants, golf packages, clothing, sunglasses, skate board gear and more. Wine, beer, and light snacks will be available along with great music. Bring your family and friends and help the cause by bidding on your favorite piece. Kids ARE welcome! Come help out to serve dinner to the deserving students, parents and siblings at the Monarch School. We are looking for volunteers. Kenny Hoyle pro skater and all around great guy held his video release party at Pizza Port for his new short video called "Poods". Kenny decided to name the video "Poods" after filming the entire piece at "Poods" Park in Encinitas. Kenny said to the crowd before the release that after going through a brief period of being burnt out on skating he started skating "Poods Park every day and became completely energized and excited about skating again. Also his fond memories of Ian "Poods" Barry inspired him to push himself and create this video. Proceeds from the sale a one time "Poods" IPA were donated to RFTH by Pizza Port. Thanks Kenny and Pizza Port. Lake Sequoia, Sequoia National Forest, CA. Through generous donations to RFTH we were able to provide full camp scholarships plus transportation to these 11 young men. They spent one full week session at The Element/YMCA Skate Camp on beautiful Lake Sequoia with an incredible staff and pro skaters from Plan B skate team. Beside improving their skating skills immensely the were able to enjoy the amazing beauty of the great outdoors. Truly a life changing experience for all of the young men. This picture is from a meeting/pizza party with all the campers two night before they left for camp. They all received a new pair of Vans skate shoes, Brixton T's and hats and complete new skateboards setups. To say they were stoked would be understating their excitement. RFTH was proud to donate another complete portable skate park to North County Lifeline in Crown Heights, Oceanside. This minipark will keep these kids off the streets and give them a healthy, safe place to recreate. David Stoddard shared his entrepreneurial insights and his marketing knowledge and passion for the clothing business that he, Mike Chapin and Jason Young stared just over ten years ago. The kids then got to skate the bowl, nosh on some pizza and walk away with some cool Brixton swag. Bring your family and friends for a fun night of food, great beer, music and slideshow with legendary skateboard photographer, Grant Brittain. Grant has been photographing the world’s best for the past 37 years, was Photo Editor for Transworld Skateboarding Magazine for 20 years and Co-Founder and Photo Editor of The Skateboard Mag. His insightful and funny narrative of his travels and adventures chronicling over 37 years makes for a fascinating and entertaining evening. This will be a donation based event with all proceeds going to Rollin’ From The Heart. We were so happy to be able to donate over 300 pair of new Vans shoes to all the deserving kids at the Monarch School in San Diego. There will be a bunch of kids sporting some cool new kicks in Barrio Logan in the next few weeks. Happy to hold our first after School Skate Jam with the kids at Keiller Leadership Academy in Encanto. Thanks for all the donations of clothing and skateboards and a cool day of skating at Pood Parks. All of these gently used clothes and shoes along with skate equipment will be donated to children and young adults affected by homelessness and long term foster care. We appreciate all the love and support. RFTH is proud to partner with North County Lifeline to bring a safe and fun place to skate in Crown Heights for all the wonderful kids who live there. Thanks to Dennis Telfer for giving the kids from Keiller Academy a tour of the facility and a inspiring them to follow their dreams. Also for explaining all the career opportunities that exist in your industry. Thanks from RFTH! Thanks to Dennis and all the folks Sector9 for sharing all their wisdom, knowledge and entrepreneurial spirit with the kids from The Monarch School. Distributed about 30 new skateboards to the high school students at Monarch. The kids were thrilled to skate with our incredible skate mentors. Good food and music all added to a stellar day. 15 young adults and their children spent the day at the beach learning to surf and boogie board with our amazing surf mentors. Sun, surf, food and friends, what a beautiful way to spend a late summer day! What a thrill to be have sent these 4 wonderful young men off for a week to the Element/YMCA Skate Camp at Sequoia Lake. The first event at Casa de Amparo proved to be such a success that they invited RFTH back for a second skate jam. Word spread quickly between the Casa children about their fun experience with RFTH that even more children wanted to participate. This collection of old and new faces created an exciting dynamic for the volunteers, as they both got to foster old relationships and establish new ones. The positive impact RFTH had on the community through skateboarding inspired more professional skateboarders, such as Ryan Bobier, to get involved. Again, with the help from our generous sponsors and donations, equipment & apparel were provided so that every child could leave with the necessary gear to skate on their own. The event proved to be as successful as the first and showed how RFTH could continue to expand & create new relationships with underprivileged youth through the power of mentorship. Rollin’ From The Heart’s first official event took place at Casa de Amparo. Casa is a refuge for at-risk children and parents that reinforces family bonds and steps away from cycles of abuse into healthy family relationships. RFTH collaborated with Casa to mentor the underprivileged youth. 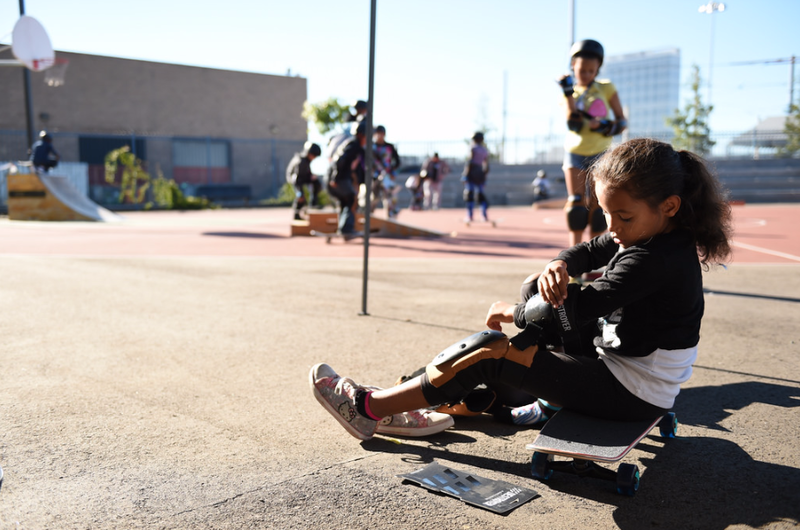 With generous donations from various skate company’s such as Brixton, Pro-Tec andSurfride, the children were provided with their own skateboard, helmet, pads & apparel. Professional & amateur skaters such as Brian Hansen, Jordan Taylor, and Sean Conover acted as mentors, teaching kids everything from screwing on the wheels to learning basic skate tricks. What went from a timid atmosphere turned into a loud and spirited day full of positive experiences & new friendships. Our very first RFTH skate jam at Casa De Amparo. One year and 1 day after Ian "Poods" Barry's passing. What a way to celebrate his legacy!